The energies represented by the various neteru (gods/ goddesses) rarely function individually, but are often allied or fused with other neteru (gods/goddesses). The union of certain pairs of complementary energies/attributes (masculine and feminine forms) results in a third energy/attribute. Trinities are sometimes portrayed together as a single composite entity; sometimes separately and sometimes in binary form. In human terms, a family consists of a man, a woman, and a child. The three are one unit—a family. There are also binary relationships such as: husband–wife (marriage), father–child (fatherhood), and mother–child (motherhood). Egyptian deities are connected in a complex and shifting array of relationships. A neter’s connections and interactions with other deities helps define its character. Such relationships were the base material from which Egyptian allegories were formed. A distinction must be made between associations of deities and manifestations of a neter principle into other neteru’s principles/forms. For example, it is wrong to assume that Re-Sebek is an association of two deities. When we realize what Re REPRESENTS, then we can figure out that Re-Sebek is the manifestation of the creation force [being Re] into the Sebek form/aspect. As mentioned earlier, the Litany of Re shows his manifestation into 75 forms/aspects. Synergetic combinations were not permanent. A neter/netert who was involved in one combination continued to appear separately and formed new combinations with other deities. 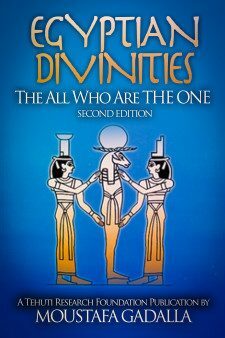 The Ancient Egyptians recognized the significance of trinity in the creation process. As such, Ancient Egyptian texts rendered the trinity as a unity expressed by the singular pronoun—it is the Three that are Two that are One. “After having become one neter (god), there were [now] three neteru (gods, goddesses) in me …”—referring to the triad of Atum and the dual Shu-and Tefnut. The various trinities are related to various nature of the duality within each trinity. Some trinities were discussed throughout this book. For more detailed examples, read Egyptian Cosmology: The Animated Universe [Third Edition] by Moustafa Gadalla. At number 8, we find the human being created in the image of God, the First Principle. Our earthly existence at the 8th realm is a replication and not a duplication—an octave. An octave is the future state of the past. The continuance of creation is a series of replications—octaves. Eight, then, corresponds to the manifested physical world as we experience it. and then I am One again. This new unity (One again) is not identical, but analogous, to the first unity (I am One). The old unity is no longer, a new unity has taken its place: The King is Dead, Long Live the King. It is a renewal or self-replication. And to account for the principle of self-replication, 8 terms are necessary. Eight is the number of Thoth and at Khmunu (Hermopolis). Thoth (aka Hermes/Mercury) is called the Master of the City of Eight. Thoth was the messenger of the neteru (gods, goddesses) of writing, language, and of knowledge. Thoth gave man access to the mysteries of the manifested world, which were symbolized by the number Eight. Stanza 80 of the Ancient Egyptian Leiden Papyrus J350 retraces the Creation as told in Khmunu (Hermopolis), which deals with the Ogdoad—the Primordial Eight which comprised the first metamorphosis of Amon-Re, the mysterious, hidden one who is recognized as Ta-Tenen at Men-Nefer (Memphis); then Ka-Mut-f at Ta-Apet (Thebes) – yet all the while remaining One. At Memphis, Ptah, in his 8 forms, created the universe. At Heliopolis, Atam created the 8 divine beings. At Khmunu (Hermopolis), 8 primeval neteru—the Ogdoad—created the universe. They were the representation of the primeval state of the universe. At Luxor (Thebes), Amun/Amen after creating himself in secret, created the Ogdoad. The manifestation of creation through 8 terms is also reflected in the mystical process of squaring the circle. [See the details in an earlier chapter as it relates to the duality of Re &Thoth]. Egyptian texts state that Nun—the pre-creation chaos—possessed characteristics that were identified with four pairs of primordial powers/forces. Each pair represents the primeval dual-gendered twins—the masculine/feminine aspects. The four males of the pairs are represented as frogs. The four females of the pairs are represented as serpents. The eight beings are depicted with their legs tied, indicative of their essential nature as being action; but while in the subjective realm (before creation), they are inert. Having their legs tied represents their potential energies. Number nine marks the end of gestation and the end of each series of numbers. If multiplied by any other number, it always reproduces itself (3 x 9 = 27 and 2 + 7 = 9 or 6 x 9 = 54 and 5 + 4 = 9 and so on). Nine marks the transition from one scale (the numbers from 1 to 9) to a higher scale (starting with 10), and so it is the number of initiation, which is again similar to the birth of a baby after nine months. A human child is normally conceived, formed, and born in nine months; a fact which has a good deal to do with the role and importance attached to the number nine in ancient Egypt. Correspondingly, the Ancient Egyptian refers to a group of nine divinities as one unit—being an Ennead. 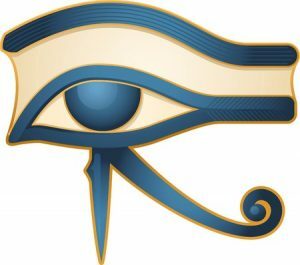 As stated earlier, we find that as far back as at least 5000 years ago, the Pyramid Texts reveal the existence of three companies of gods, and each company consisted of 9 neteru (gods, goddesses). The Egyptian texts speak of three Enneads—each representing a phase in the creation cycle. The nine aspects of an Ennead are not a sequence, but a unity—interpenetrating, interacting, and interlocked.